When I saw a Cavalier for the first time at my friends home, it was love at first sight and I just had to have one. Finding one was quite a mission. 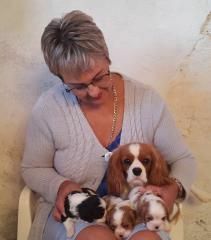 There are only a few breeders in South Africa and I wanted one without breed restrictions so that the puppy could be used for breeding when old enough. After a very long search I eventually found a litter in Johannesburg and was able to get a boy. It was almost a year later that I managed to get a little girl as a wife for my boy. It was worth the wait in the end when they were old enough as they had beautiful puppies. The cavaliers have the sweetest most loving natures and those gentle eyes are so hard to resist. They adore people and are great with children and other pets. They will fit into any lifestyle, whether you are a couch potato or a keep fit athletic type, all they live for is to please you. 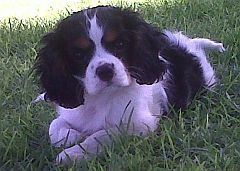 Cavaliers are highly recommended for children with disabilities because of their patient and tolerant nature. In spite of all the health issues one sees on the internet mine are very healthy and active, even my oldest one who is now seven. Hopefully I will be able to get another pair in the next year or two to improve my gene pool. I register my puppies with KUSA and give a registration certificate to the buyer. Puppies are microchipped. Breeding restriction.